Great Blue Heron wildlife Statue 24 X 17 X 38 in., Full life size and Limited Edition! Featuring artist quality collection of realistic and collectable wildlife Birds 3 sculpture artist editions. Wood Stork Feeding Lifesize 22 in. Absolutely Beautiful museum quality shorebird for beach and waterfront. State of the art edition of high strength and nontoxic 'Poxy-porcelain©'. • Indoor - outdoor. • made in USA exclusively by Chris Dixon Studios. width 24 X depth 17 X 38 inches, Fully life sized and free-standing over 3 feet tall! 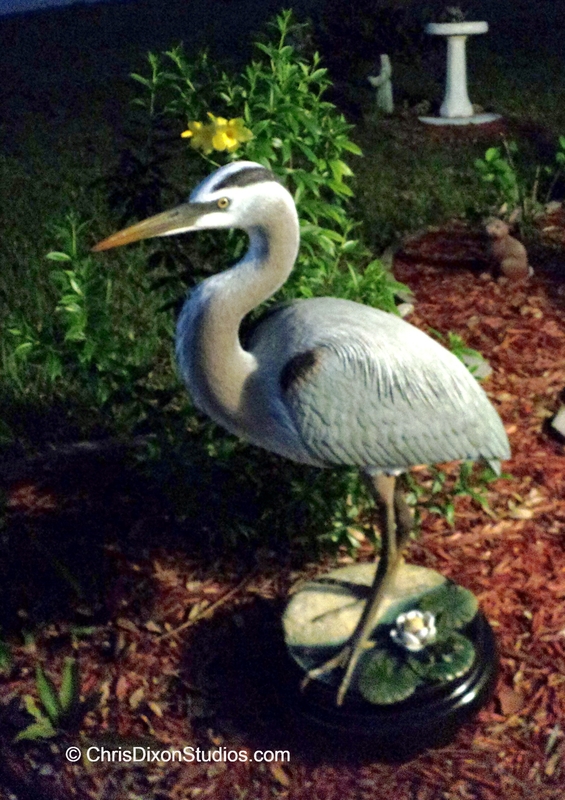 A Great Blue Heron Lifesize wildlife art sculpture, limited edition of only 1500. This waterfowl shorebird is suitable for exterior use in the porch or garden; with the wildlife! Truly an amazing waterbird art sculpture at any price. • The artwork is cast with hand painting to a very natural look. • State of the art edition of high strength and nontoxic 'Poxy-porcelain©'. • Indoor - outdoor, light weight and scratch resistant - Absolutely Beautiful. • World wide collectable artist with 27 years of professional sculpting experience producing fine details and quality of craftsmanship; made in USA exclusively by Chris Dixon Studios. This waterfowl shorebird is suitable for exterior use in the porch or garden; with the wildlife! Truly an amazing waterbird art sculpture at any price. • The artwork is cast with hand painting to a very natural look. • State of the art edition of high strength and nontoxic 'Poxy-porcelain©'. • Indoor - outdoor, light weight and scratch resistant. made in USA exclusively by Chris Dixon Studios. Hi-strength Epoxy is re-inforced with fiber and steel for easy to move a durable display. Very lightweight only 23 pounds! Wide stable base. Epoxy is tinted to block damaging UV light Can totally custom create yours larger with custom finishes, modified designs, even fountain tubing. If this one is sold artist will create another one similar for you in about 3 extra weeks. Own a truely unique American artist original sculpture artwork. Custom made in USA exclusively by Chris Dixon Studios. Each is an Artist Original! Blue Heron ( H 44 in. x 27 L in. X W 19 in.) Quality craftsmanship of unique heavy duty construction using steel rod reinforced Epoxy resin with lightweight foam core, durable acrylic finish painting and glass eyes. Hi-strength Epoxy is re-inforced with fiber and steel for easy to move a durable display. Very lightweight only 23 pounds! Wide stable base. Epoxy is tinted to block damaging UV light Can totally custom create yours larger with custom finishes, modified designs, even fountain tubing. If this one is sold artist will create another one similar for you. Own a truely unique American artist original sculpture artwork. . If this one is sold artist will create another one similar for you. Own a truely unique American artist original sculpture artwork. Artist Original!! Blue Heron statue ( H 44 in. x 27 L in. X W 11 in.) Unique artwork using steel rod reinforced resin with lightweight foam core, durable acrylic finish painting. An easy to move a durable display. Artist Can totally custom create yours larger with custom finishes, modified designs, even fountain tubing. If this one is sold artist will create another one similar for you. Own a truely unique American artist original sculpture artwork. . If this one is sold artist will create another one similar for you. An easy to move durable display. Own a truely unique American artist original sculpture artwork.